I’m honestly not really sure where the inspiration for this dish came from. My son, in his culinary classes in high school, had to learn how to and practice carving up a chicken (called “fabricating”). He had shown me one way to do this about a year ago, but this time, he’d learned a way with some slight variations. He showed me this new way, and I took pictures along the way, so I’ll probably include all that here in the blog eventually. It’s a very useful skill to have. So, of course, as he was practicing these skills, we had a bunch of chicken on hand that needed to be used for something, right? Not gonna throw it away, right? The first step is to prepare the meat. If you’re cutting up a whole chicken, that would probably take about a half hour. Since the breasts were the largest pieces of the chicken, I cut each one in half, so that it was about the same size as a thigh. Once it was all cut up into pieces, I made sure they were dry, and seasoned each piece with salt and pepper. I set these aside. If you don’t carve up a whole chicken, you can just use packaged breasts, thighs, or other pieces. You can use frozen chicken pieces, too, but make sure that they’re well-thawed and patted dry. Then season them and set them aside. The next step was to mix up the baste. I started with the yogurt. Someday, I’d like to try this with greek-style yogurt, because I really like the texture. But this particular week, I didn’t like the price, so I just went with generic plain yogurt. I mixed in the curry powder and stirred that in. Different manufacturers make different curry powders. Some are more yellow, others, more red. Some are hot, some are more mild and zingy. You can adapt to whatever you’ve got as long as you taste along the way. Then, I added the other spices and flavorings, stirring and tasting as I went. Decide in advance how hot you want to result to be, and shoot for that level with the chili powder. Be cautious with it. Add a little, taste, then add a little more, etc... Be aware that the yogurt will cool the capsaicin a little, so the heat will come on kind of as an after taste. Finally, be liberal with the mint. That adds a rich coolness to the tang of the yogurt and the spice of the curry and chilli powder. Then, I went out and lit up the coals. While they were getting glowy, I chopped up the onions and potatoes into 1” sized chunks and tossed them together into the Dutch oven. They’ll be delicious, and will lift the chicken up out of the juices that will gather at the bottom. 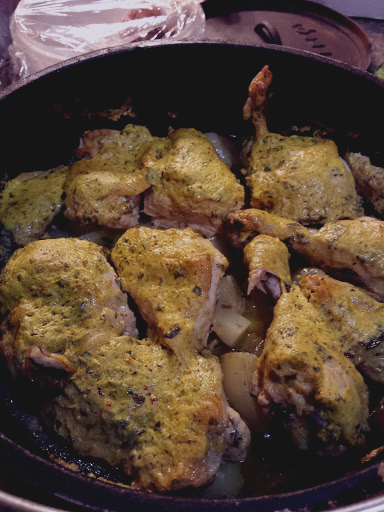 The last step is to layer the chicken pieces over the onions and potatoes, and the thickly slather the yogurt mix over the top of the chicken. Close up the lid, add the coals above and below and begin baking. I cooked them until they were at an internal temperature of about 175℉. Chicken is actually safe to eat at around 160, but if you cook it longer, it falls off the bone more, and is more done. It won’t dry out in a Dutch oven, because the heavy lid traps the moisture. It took about 40-50 minutes for it to be done. About half-way, I put on more baste. In the end, it was delicious! The leftovers the next day were even more flavorful, as the herbs absorbed deeper into the yogurt.